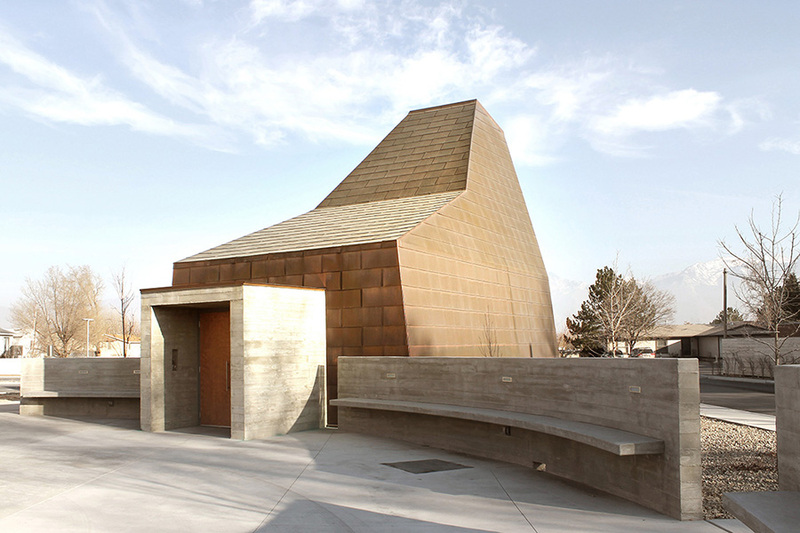 The design process for this intimately scaled chapel for daily worship began with a research phase recognizing the rich history of the West Jordan, Utah community this church serves. Located in the immediate vicinity is the Kennecott copper mine, the world’s largest open pit mine. Working class immigrants looking for employment settled the area and built a small church originally on this site. Linking the historical with the spiritual, Saint Joseph, a carpenter often depicted with tools in his hands, is the Day Chapel’s namesake. In an effort to celebrate this rich cultural lineage, common materials confronted in daily life, such as concrete, wood, copper and glass, were incorporated. These materials were then detailed to express the skill of the craftsman. Custom bent, flat lock copper panels, for example, were used on the exterior of the chapel thereby incorporating tangible references to the parish’s mining and construction history. In keeping with the design goal of sustainability, the Day Chapel, which is more frequently used than the main sanctuary, is thermally isolated thereby reducing the daily heating and cooling loads. Natural light enters through a single aperture, illuminating the custom marble and steel contemporary altar furnishings designed by Sparano + Mooney Architecture.